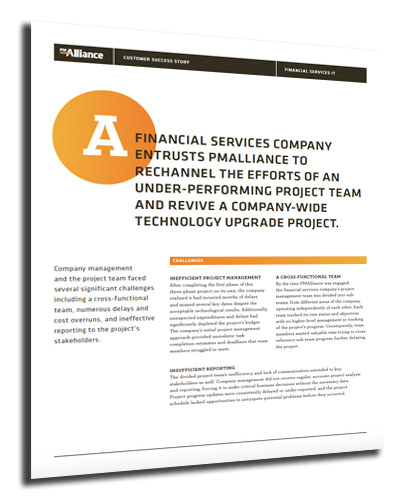 A financial services company asked PMAlliance to redirect a stalled project for a complex technology upgrade. Company management and the project team faced several significant challenges including a cross-functional team, numerous delays and cost overruns, and ineffective reporting to the project’s stakeholders. Learn how PMAlliance's Duration-Driven Methodology helped turn this project around. Download the whitepaper by filling out the form.